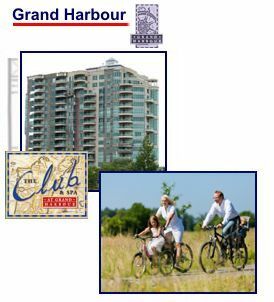 Grand Harbour is located on Barrie's beautiful waterfront. 1, 2 and 3 bedrooms are available. It has a fabulous recreation facility housed in a two-story podium for your enjoyment. It offers a large exercise room, billiards table, indoor pool, sauna and whirlpool spa. Grand Harbour also offers a lounge equipped with a cappuccino bar, full kitchen and full waterfront views of Kempenfelt Bay for private entertaining. Close to restaurants, City Transportation, Downtown Barrie, shopping, parks and City Marina.